If you’re looking for the perfect gaming monitor to pair with your new AMD Vega 64 graphics card, your search is over; meet the ASUS ROG Strix XG35VQ with AMD FreeSync, a 100Hz refresh rate, and the exclusive Extreme Low Motion Blur technology. Furthermore, the display features an ergonomic ultra-thin design with ambient lighting, a 1800R curvature, and extensive connectivity options. The ASUS ROG Strix XG35VQ is based on a VA panel with a 2,500:1 contrast ratio for the superior relation between the brightest and the darkest colors as well as exceptionally deep black shades. The VA panel also ensures 178-degree wide viewing angles, a 100% sRGB color gamut, and a quick 4ms response time speed (gray to gray pixel transition). Straight out of the box, the ASUS XG35VQ 100Hz gaming monitor delivers an outstanding picture quality though the first thing we had to do was decrease the brightness as it was too bright. Not only does the display offer true black colors but the colors surpass the specified 100% sRGB color gamut. However, it’s still not recommended for color-critical work as the viewing angles cause contrast shifts when the screen is viewed from above or below – as is expected from a VA panel; that’s why professional designers opt for IPS panels instead. The huge curved 35-inch display features the UWQHD screen resolution with 3440×1440 pixels which will immerse you into the gaming world with its crisp and vibrant image quality. With roughly 106 pixels per inch, there’s an abundance of detail as well as more than enough screen real estate. Due to the nature of VA panels, smearing and ghosting of fast moving objects is noticeable, more so when darker scenes are involved as pixels take longer to shift from such deep black tones. In the OSD (On-Screen Display) menu, the OD (Overdrive) setting offers six different levels to improve the response time, from 0 to 5. At 0, ghosting is quite noticeable while at 1,2, and 3, it gets a little better. We recommend setting it to 4 – or to 5 if you’re playing at high frame rates though then some overshoot (inverse ghosting) may be visible as well. The color and brightness uniformity is top-notch with excellent greyscale performance and minimal backlight bleeding. The display doesn’t use PWM (Pulse Width Modulation) to regulate brightness, so there’s no screen flickering. Lastly, the ASUS XG35VQ input lag performance is outstanding at just below 7ms. The ASUS ROG Strix XG35VQ also offers a backlight strobing technology dubbed as Extreme Low Motion Blur. You can enable this feature in the OSD no matter whether you’re using an AMD or NVIDIA card though it only works at fixed refresh rates, at 85Hz and 100Hz. Moreover, the image becomes darker as maximum brightness is reduced when this technology is enabled. Note that you can only use it if the monitor is connected via the DisplayPort and that you won’t be able to adjust the Overdrive settings. While the Extreme Low Motion Blur does eliminate ghosting to some extent, it is still somewhat noticeable, especially if you’re playing fast-paced games with darker scenes. 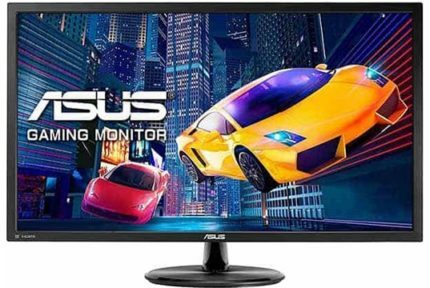 Therefore, if you mainly intend on playing competitive and FPS games, we recommend you get a gaming monitor with a faster response time speed. For RPGs and other graphically-oriented games though, the ASUS XG35VQ is absolutely perfect. 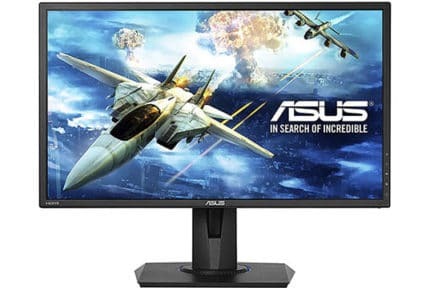 If you have an AMD’s FreeSync-compatible graphics card, you can also make use of the monitor’s FreeSync technology which synchronizes the monitor’s refresh rate to the GPU’s frame rate. By doing so, all screen stuttering and tearing will be eliminated within the dynamic range. The ASUS XG35VQ FreeSync range amounts to 48-100Hz via both DisplayPort and HDMI 2.0 ports and LFC is supported. 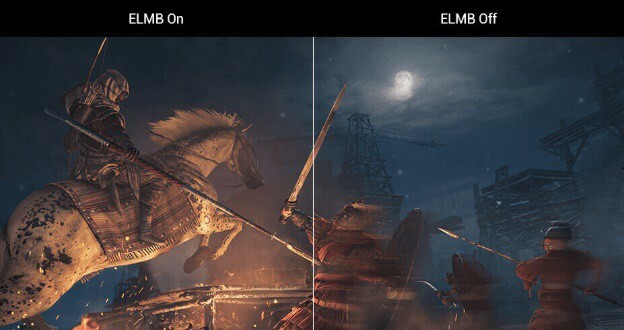 Keep in mind that FreeSync cannot work at the same time as Extreme Low Motion Blur. The OSD consists of numerous exclusive game-enhancing features such as the pre-calibrated picture presets (FPS, RTS/RPG, MOBA, Racing, sRGB, User, Scenery, Cinema) as well as the Picture In Picture and Picture By Picture modes, and the ASUS GamePlus features (crosshair overlays, an on-screen timer, and an FPS counter). Navigation through the menu and features is easy and quick thanks to the OSD joystick placed at the back of the monitor. 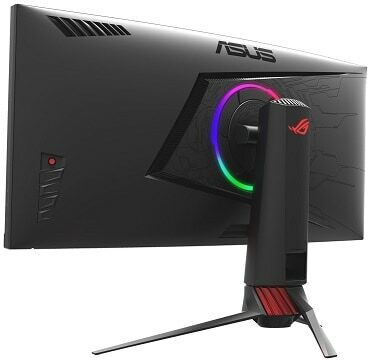 The ASUS XG35VQ monitor also offers the exclusive AuraSync Lighting technology which allows you to synchronize the glowing RGB LEDs at the back with the rest of your AuraSync-compatible gear. Like most of the newer ROG Swift models, the XG35VQ can also project the LED Light in Motion ROG logo. Application developers can also fiddle with this technology using the AuraSDK software which can synchronize the RGB lighting with in-game audio. The ASUS XG35VQ features an attractive design with lots of shining gimmicks and a premium build quality including an aluminum stand and matte plastics. Connector ports include an HDMI 2.0, an HDMI 1.4, a DisplayPort 1.2, a headphones jack, and two USB 3.0 ports while ergonomics offer tilt, swivel, and height adjustments as well as VESA mount compatibility. The screen of the monitor is covered with a light matte coating which eliminates the sunlight reflection without affecting the picture quality. There’s also a cable management bracket at the back. The ASUS ROG Swift XG35VQ price is around $730. Alternatively, you may be interested in the BenQ EX3501R which has entry-level HDR support, but no motion blur reduction technology. If you have an NVIDIA GeForce GPU, check out the Dell Alienware AW3418DW ultrawide monitor with G-SYNC. 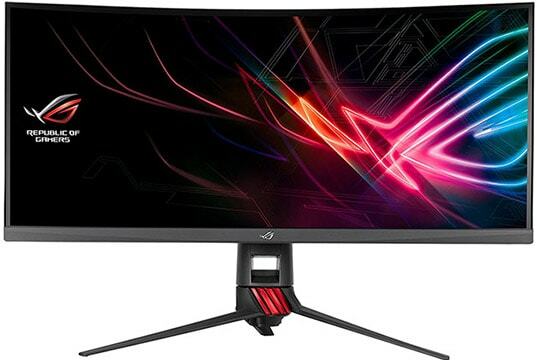 While it’s good to see that more and more gaming monitors are coming with the backlight strobing technology, especially the VA panels which need it the most, we are still not satisfied with the amount of ghosting that persists in fast-paced games. So, we are left where we started – competitive FPS gamers having to sacrifice image quality for the best performance, while other gamers who are seeking monitors with high contrast have to cope with the motion blur, though with a little bit less of it. All in all, since the ASUS XG35VQ isn’t intended for professional fast-paced gameplay anyway, we can’t hold that against it. The image quality and overall performance are exceptional while the extra features and the premium design are the icing on the cake. The ASUS ROG Strix XG35VQ delivers an immersive gaming experience thanks to its high refresh rate, high resolution, and striking colors and contrast. It looks gorgeous and has plenty of unique features as well as extensive ergonomics and connectivity. Though it offers backlight strobing, ghosting is still the weakest point of this gaming monitor, but it's tolerable considering it’s a VA panel.